So you’ve decided to commission a horse portrait, great choice. Horse portraits are a beautiful way to honour your bond with your horse. But what are the sort of horsey photos to take so the equine artist in you and me remains HAPPY? With only a few days to go before Equitana, where I’ll be teaching and talking about equine art, here is a bit of an insight into an element of my equine art life that could help you help your artist create an equine masterpiece. I paint a LOT of horses and generally deal with good photos and some which are not quite so good. There are some really simple things to consider when taking your horse photos which will result in some great pics; some with accuracy in conformation, and some with epic distortion. Knowing how to do this, so you’re taking photos with a purpose, will make all the difference when it comes to what you end up with, and will equip you to understand why you select certain photos for creating art with yourself, or for sending to me to work from. Personally I love the extreme diversity in the photos I receive. They inspire me and sometimes challenge me, but it’s my privilege as the artist you commission to create something magic just for you. The thought that you end up with a unique, original artwork is exciting, and as you become the creator or collector of equine art I know you’ll end up feeling it was worth the time and effort. ‘Let’s begin at the beginning‘ as Alice once said. I’ll walk you through the whole process as a timeline, and include all considerations along the way. What is the best camera for horse portrait photography? This is easy to answer, and may surprise you. The best camera is the one you have with you and that’s usually the camera in your phone. Today’s phone cameras are really all you need for just about every photo you’ll ever take, so let’s look at using them. Fancy cameras are wonderful, but consider the cost, the awkwardness of their care and management, how much time and effort goes into learning to use them effectively and I’ll bet you don’t have one with you when that magic moment happens. I studied photography when I did my Visual Arts degree at Uni and even though I know how to handle a complex camera, I wouldn’t. I leave that sort of expertise with the collection of highly skilled professional photographers out there. In fact, I’d rather buy or commission them than head out with a fancy big camera of my own any day. Respect! When’s the best time to photograph your horse? Special light like a sunset with your horse: Sunlight gives you so much opportunity for great strong colour and contrasts, reflections, shadows and glossiness. In contrast: An overcast day is wonderful for capturing very subtle colours and shapes within the form of your horse which sunlight doesn’t allow. The nature of the environment you are in: Simply, there is a lot of reflected light, from buildings sometimes, but mostly from the ground and sky. The ground colour has quite a big impact so decide what you like – grass, white sand, red earth as it will colour your horse. An asset worth considering. I use all these options with equal enthusiasm and in fact, my most epic image is not of my horse, and was taken on a very dull day in a grey earth paddock. The huge pastel ‘ Kaleidoscope’ which was the result, will be at Equitana for you to enjoy, as will ‘ Red Mare’ who reflects the green grass of New Zealand. What should your horse be doing in your portraiture photograph? Something quirky: This is a cool thing. Especially if you’ve a trick horse or a character a bit like my beloved ‘Tooky’ who does all sorts of spins and rearing for the camera. She allowed me to develop the ‘Tooky in Ink’ series which resulted in around 70 paintings, which now reside in collections worldwide. A quirky perspective: Another side of this relates to composition, the proportionate horse or horse portrait vs the distorted big head or big nose portrait (they’re great for showing your horse’s personality). A fantastic glossy coat or braiding job: Oh Yeah! Love it when that summer coat comes out at the same time as our strong bright sunshine. Capture that, we artists love it a lot cos we are the horse people wishing to see the wooly winter look gone and slave away the moment we see the first hairs shifting. (I’ m not going to comment on those who clip, you are missing this monumental change). As for the grooming efforts, a great photo of a line of neat plaits sent to me as the artist will have me thinking a lot about some pretty abstract detail, which I love to get right. It’s a big change from the usual mane, a notable challenge. Something amazing you guys are really proud of such as new track or winning at an event: Dress up your horse, show off your achievements. A friend who is there to take pics with you and your horse together: This can be so you can get that action shot together like jumping, a nifty dressage move or stunt, or something much gentler like celebrating your love or each other with an intimate portrait of you both. What’s the best way to take horse photos? Clarity: This is about two things, resolution and focus. You need a decent amount of both to have a pic worth keeping, Both are absolutely crucial to an artist, although now I’ve put in so many hours drawing and painting from many images over the years, lesser quality images will test how well I understand my subject, and in fact I thrive on the challenge, something which can be so intimidating for an equine artist in their early years. Positioning yourself in relation to your subject, and sometimes the background: Do you want to be at eye level with your horses eye? You are in a position to decide, high or even ground level, as this can result in some very interesting images, and will have significant impact when it comes to how the background relates to the horse too. Background: Background isn’t always important although certainly they are a great asset, but tree or building shadows on the horse are worth being aware of. They can spoil a shot or be a stunning effect, and I will have ‘Solar Eclipse’ hanging at Equitana as a special example of how great this can be. The original is in exhibition in the US at present, so you get to enjoy a quality, large, Giclee print instead. Your distance from the subject and the zoom feature: This is where you get some interesting effects such as the big head or big nose. That horse who loves to be in your face all the time may be the perfect subject for such an image, but if you’re looking to get a realistically proportioned image, you’ll need to back off (literally). Depth of field: The further away you get, the shallower the depth of field (tech term). What does that mean? Well, it means that the horse will be much more in proportion, head to body, nose to ears. I once thought foreshortened horse images were an aberration, an error, but for some time now I’ve loved them, and in fact have collected a beautiful horse portrait in recent years from a noted American artist which celebrates this distortion. What happens when its time for your equine artist to get to work? The images I receive have a huge bearing on the horse portrait I can create. I am an anatomist and have an obsessive need to be accurate with my drawings. When I look at the photos sent by clients, the first thing I asses is focus; this includes resolution, as an out of focus image or a low pixel quality image give me some issues to deal with, namely, fuzzy detail. There are a lot of artists who will not work with such images, but I try not to be one of them. Instead, I delve into my databank of knowledge and that obsession with anatomy becomes a great asset. I have horses in the paddock too which I can refer to if I require unusual information, but often I rely on my memory of how things look and feel (the feel concept is a bit unusual, but essentially it means I can imagine a 3-dimensional form from looking at a photo, and I use this way of ‘seeing’ to get my details right). 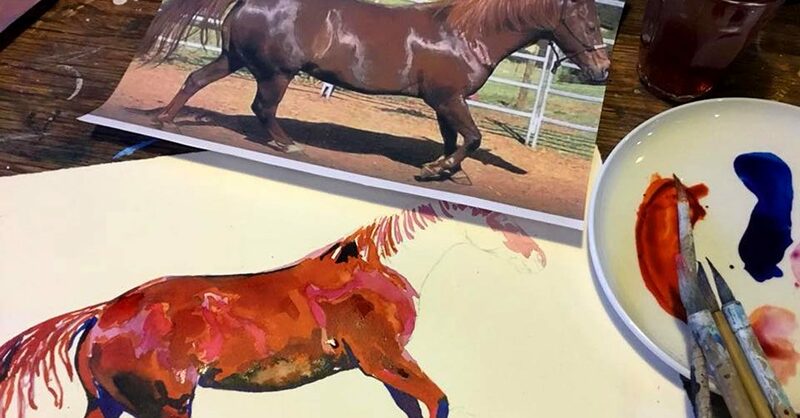 Once I’ve the right photo (and, honestly, that’s pretty much all the time), I can plan with my you exactly what I can do based on what you would like and then I get busy and start painting or drawing your horse portrait. There are a lot of other considerations within all that as you prepare to commission your horse portrait, but I’ll leave that for another discussion. Equitana is just a week away, see you soon! Please keep following as we go, I promise to keep sharing.